Natalie Stein specializes in weight loss and sports nutrition. She is based in Los Angeles and is an assistant professor with the Program for Public Health at Michigan State University. Stein holds a master of science degree in nutrition and a master of public health degree from Michigan State University. Edamame are green soybeans that contain essential nutrients such as omega-3 fatty acids, iron, zinc, vitamin C, folate and vitamin E. Available fresh or frozen, the beans can be prepared by cooking and shelling them, and you can eat them on their own or in Asian-style recipes. Although no single food causes weight loss, edamame can be part of a healthy weight-loss diet. Edamame can be part of a calorie-controlled diet to lose weight because each 1/2 cup contains only 95 calories. To be successful in weight loss, you need to consume fewer calories than you expend. Eating edamame as part of low-calorie dishes can help you reduce your calorie consumption and lose weight. Serve a veggie burger with edamame and carrots, daikon or Korean radish, ginger, garlic and brown rice instead having a higher-calorie beef burger on a refined-grain white bun. Edamame can promote fullness and reduce calorie intake because of its protein content. Each 1/2 cup of edamame provides almost 8 grams of protein, or 16 percent of the daily value based on a 2,000-calorie diet. Protein slows the emptying of food from the stomach so that hunger does not return as soon after a meal. Dip vegetables into a blend of pureed edamame with garlic, low-sodium soy sauce and lemon juice for a high-protein, low-calorie snack, or add edamame to a salad for lunch. Weight-loss diets can leave you feeling hungry or deprived, and high-fiber foods can help mitigate these sensations because they can be more satisfying to eat than low-fiber foods. 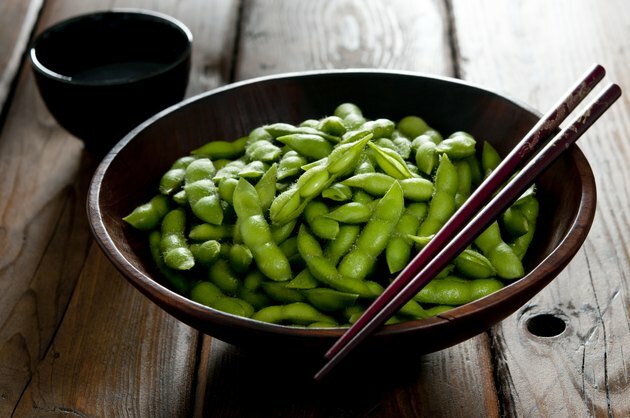 Each 1/2 cup of edamame contains 4 grams of fiber, or 16 percent of the daily value. Edamame makes a high-fiber, high-protein snack on its own, or you can dip raw vegetables into salsa consisting of cooked edamame with lime juice, garlic, cilantro and tomatoes. Although edamame is a green plant-based food, it is far higher in calories than green vegetables such as snow peas, broccoli and spinach. Control your portion sizes carefully to avoid consuming more calories than you intend when you eat edamame. Also, avoid preparing edamame in high-calorie recipes to limit your calorie consumption. Edamame contain 4 grams of fat per 1/2-cup serving, and dishes with oil, such as fried edamame, or full-fat cheese, such as Parmesan-crusted edamame, are even higher in calories and fat than plain edamame. What Are the Health Benefits of Toor Dal?